Getting Out Of The Wrong Side Of The Bed? Okay, now with everyone using microswitches and servos or induction sensors, this may seem a little late to the game but, for the ones that don’t (yet) or want to stick to simple ‘back to basics’, I’d like to talk about making sure that the bed is level so you get good prints (maybe not first time, but in single digits!). Now, mechanically, what our printer is doing is laying down a layer of plastic, lifting the configured layer height and then laying down some more. We really need the first layer to stick well (and all the others to stick to each other) as otherwise your print will come off the bed. So if you’ve carefully made sure that, when all the axis are home, you can just get a piece of paper underneath, if you haven’t checked that that’s true in all the corners, and the middle, then it’s a bit of a gamble what’s going to happen next!. So let’s start by homing all axis. Now depending on your printer, where this is will vary a bit. On the Printrbot Simple Makers edition (and like most RepRap machines), this is on the front left corner of the bed. So adjust this Z stop screw to make sure that you can just fit a piece of 100 gram card under the hot end. Starbucks give away some cards to use in the Apple store for songs, games and other stuff, these are an ideal size for this. So once that is adjusted, then go to X Max. Now here, we use the corner adjusting screw to make sure the height is right. Then we go to X Max, Y Max and adjust the corner screw and then, finally, X Min, Y Max. And that should be out four corners. Now, sometimes, when you get to one of the corners, there may not be enough adjustment in the corner screw to get the level right. When that happens, we need to adjust the Z Stop screw and then visit all the corners again. And again until we have the bed level. Then, as a final check, we move the head to 1/2 X Max, 1/2 Y Max (the centre of the bed) and check again. Now, if all the corners are flat, then the centre should be right as well – as long as the bed is flat. If it is bowed at all, then the middle will be out and we will have to investigate why then bad isn’t flat and look at ways to make it right. 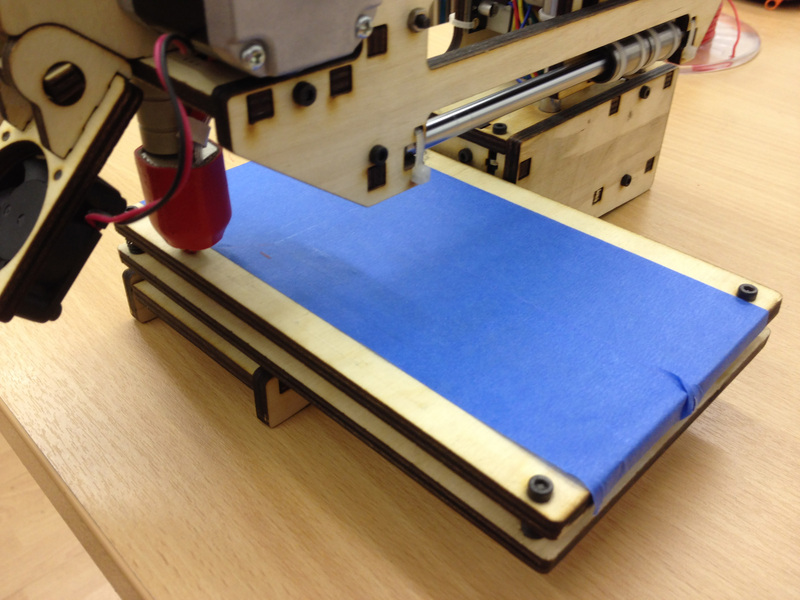 Bed Levelling is very important to overall print quality. Spending a little while getting this right will save time and disappointment in the long run.